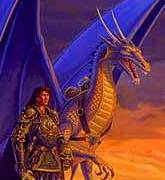 They are the most magnificent Dragons of all Krynn. With their very high intelligence, most become scholars, mathematicians, philosophers... They can change to a human or demihuman form and walk among humans without being recognised. 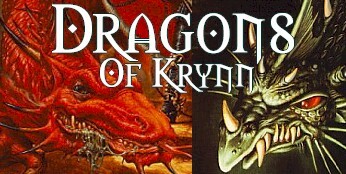 They also are the largest dragons of Krynn, going up to 50' long. They fight very well and can use magic. 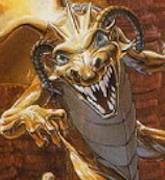 But their too high self-esteem make golds very arrogant, and they wont lower themselves by attaching to lower races, like humans, as silver dragons sometime do. 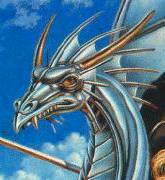 Silver Dragons are the most liked dragons of Krynn, because of their gentleness and kindness. But this is also one of their major flaw. Silvers tend to fall deeply in love with humans or demi-humans, like Silvara and Gilthanas. As gold dragons, they can adopt human or demihuman form very easily, and feel as comfortable as humans as in their dragons bodies. They are as strong as red dragons. They believe in the cause of good, and would even give their lives to make the world better. Brass Dragons prefer dry, sandy and sunny regions where the sun can toast their scales. Brass are selfish, and very proud. Their major flaw is their desire for small talk. They acknowledge dozens of languages, so it is easy for them to find people whom to converse with. They have no real interest for art and culture, and believe the strong should rule. Bronzes like water, and tend to live near it, along with the humans and demi-humans living near waters. They love treasures, but only acquire them by slaying evil monsters or beings. They dislike killing, although they enjoy war and battling evil creatures. 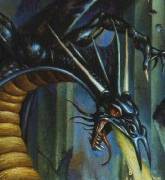 They attack lesser creatures with claws, tail and fangs and keep spells for more intelligent creatures, like evil dragons. They can breath both lightning or a repulsive gas, and often use ESP to communicate or read there opponents' minds. Coppers are very selfish, still they are very good-hearted. They are really loyal to their friends, but seldom trust strangers. They are the smallest of all good dragons, but their magic is very powerful. They normally live in rocky caves or mountains. They only fight when very needed, or when someone dear is in danger. They start a fight by breathing Slowness gas, and then cast a bunch of inoffensive spells at their enemies. If their enemies don't turn back and go away, they can always breath a stream of acid on them, but they despise the act of killing. 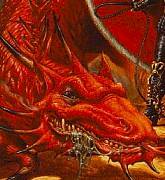 Reds are the most powerfull of all evil Dragons. They cooperate with other Dragons, but refuse orders if they don't agree with them. They love killing and destroying. They are very loyal to the Dark Queen too. They live in mountainous, even volcanous regions. They prefer to use spells to defeat their opponents, as their breath weapon, a cone of white-hot fire, destroys every of their opponents' possessions, even magic items. Greens are notorious for their cruel nature and vicious temper. They only respect their leaders and masters, holding much of the others in disdain. They prefer to trick their ennemies in deadly traps or use magic against them to close, claw to claw, tail to tail combat. They live in deep woods and forest. They pass days counting their mass of treasures, and their treasures truly are great! These immense creatures live mostly in deserts and dry lands. 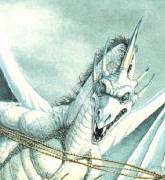 They are very cooperative, and tend to work together much more than any other kinds of Dragons. Their breath weapon also is very powerful: a lightning bolt nearly 100' long, fierce, precise and lethal. They also are good allies during war times because they are so cooperative. They are so close altogether that the death of a friend will plunge them in a deep depression. They will then lose much effectiveness in battle. These slim dragons make their home in jungles or marshes. They feed with the animals living there. Their homes are dark, even darker then them, making it very difficult to notice their presence. They are very impulsive, and most of the time attack before they think. They are rarely used by Takhisis, for they are very independent. They have almost any kinds of treasures in their collections, ranging from coins and gems to weapons and powerful artifacts. They fight fiercely with fangs, claws, tail and breathe streams of acid to their opponents. They only come to use spells when really needed. Although weaker and less smart than the other of their kind, whites are terrible foes. They prefer solitude, and mostly live in cold, icy lands such ice the Icereach. They collect only small treasures, as they truly have nothing to do with them. 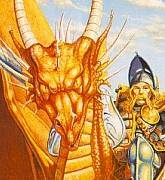 However, they own the most flawless item of Krynn. Pure gems such as diamonds, and unrivaled beautiful jewels. They breath a cone of frost on their ennemies before finishing them with spells and physicall attacks. They are as effective under water as in the air. These crossbreed between sea Dragons and Green dragons cannot fly and move awkwardly on the ground. They look like giant toads, and can change their skin color to match their surroundings. They sustain by eating sea beings and attacking ships, even without provocation. When fighting, they first of all use their spell, as they don't like physical combat. If that isn't enough, they use their breath, a deadly stream of acid, or use their long, taod-like tongues to catch theyr meal like a toad would do with a fly. Sea dragons look like a cross of a turtle and a dragon. 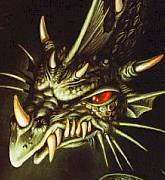 They live in Krynn's oceans and often attack ships or small coastall communities. Few creatures or men are known to have crossed a Sea Dragon's territory and have come back afterwards. Tey can live both in water and air, and breath a cone of hot steam at their opponents.